Technology when it relates the the automotive service equipment industry is always changing. It’s no different with battery testers. The old carbon pile load battery testers were great in their day, and they can still perform an important task, but the new battery testers are superior in many ways. These new testers function with a conductance system, and have a screen that allow you to perform various tests on the entire electrical system. You can gain a thorough knowledge of the charging and electric system condition with these new system testers more efficiently. 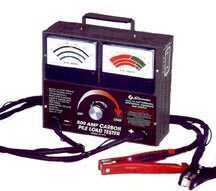 The Solar1855 Carbon Pile Load Tester is made for professionals and the serious DIY crowd. 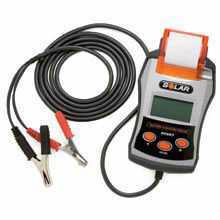 Ir is a variable load carbon pile tester that offers complete and reliable accuracy when performing battery load tests. It has an 800 amp load test for 12 volt batteries, alternators, starters and regulators. It tests batteries all the way up to 1600 cold cranking amps, has color coded full size voltmeter and ammeter to clearly monitor testing process, super grip heavy-duty battery clamps and a one year warranty. it has easy, intuitive operation with accurate, and speedy assessment of battery condition and starting and charging system performance. Can test up to 2000 cold cranking amps, has an LCD display, 10 foot cables, polarity protection, and an integrated printer. All this in one small 5 lb. package. It is multilingual, is compatible with most battery types, including flooded, AGM and Gel Cell. It has a back lit LCD screen for low light conditions and a case for safe storage. It can even compensate for temperature. As you can see, when you jump from old technology to the latest, state-of-the-art technology, you can enjoy some valuable benefits. What type of battery / starting system tester does your shop have? Are you happy with it’s features? Are there certain features you need? If Google has it’s way, there may be a time in the not too distant future when you can just jump in your car, tell it where to go, and sit back and let it take you there. Then maybe you can get some work done, read a newspaper, put on your make-up, or just relax. Well, maybe that’s hoping for too much. You’ll probably want to monitor your progress and make sure you’re traveling safely. They’ve pioneered a technology that allows an automobile to safely drive itself. Google believes this technology will eventually make driving safer, potentially eliminating “driver error”. Speaking for ourselves, we trust our own driving more than we would a computer, however we’re not so sure about everybody else. We’ve seen too many people DWD (driving while distracted). Lots of cell phone users, moms yelling at children in the back seat, women applying makeup, and even guys reading the sports page. Most of the cars you’ll find in auto body shops across the country that are in there for repairs sitting up on the Automotive Lift because of human error. So it stands to reason that if you remove that problem from the equation, you should be able to lower the statistics. What do you think? Would the roads be safer with cars that don’t have human drivers? Check out the collection of accidents below. We’ve had another great year thanks to great customers like you. We’ve sold plenty of Automotive Lifts, Floor Jacks, Air Compressors and Tire changers over the past 12 months. We’ve truly been blessed. One way we share our blessings is by donating to our favorite cause – Homes For Our Troops. You’ve heard us talk about it before. You’ve seen links to them on our web site. We won’t stop talking about them until they’re no longer needed. They fabricate specially adapted homes for injured and disabled veterans returning from recent conflicts in Iraq and Afghanistan. They’ve recently completed construction of their 100th home. They are supported by celebrities like Billy Joel and Phil Mickelson. They are highly rated by major charity watchdog groups. Only 8% of funds raised go toward fundraising and administration. Please take the initiative to help those who have made great sacrifices for the security of our nation. We cannot think of a better cause. Check out the video below. After a brutal two years that saw the worst conditions for the automotive industry since the great depression, things have finally turned around. Car sales in the USA in November were very strong, growing at a pace of 17 percent, and leading experts to revisit their estimates for sales in 2011. The pace is much stronger than last year, when sales in the US were at a mere 8.6 million new cars. Still, for all of 2010, sales are currently at only 11 million or so. Not anywhere near where they were just a few short years ago. The slowest of all the major manufacturers was Toyota, still reeling because of it’s own self induced problems due to it’s recent recalls brought on by safety issues. Most other manufacturers saw gains of better than 10%. At Ford for instance, sales were very strong, especially for trucks and the Ford Fusion. These figures come at a time that US car makers needed. After the bailouts, there were dire predictions for US auto makers. Consumers will eventually have to purchase cars at a higher rate, and the population grows and the economy continues to recover. Still, industry analysts don’t expect to go back to the good old days of 17 million cars sold any time soon. Most have kept their expectations to somewhere around 13 million for 2011, and not reaching it’s old highs again for another four to five years. There are also many used vehicles on the road today, a much higher percentage historically than usual. This means people will need spend more to repair and maintain their cars. When they bring their vehicles in to their local auto dealer, or repair shop for service, and the car is up on the Auto Lift, there is an increased likelihood that they will need major service. At some point, they will weigh the costs of repair vs the cost of a new vehicle, and a decision will be made to purchase a new vehicle. It’s just the nature of the American public. Car sales will eventually pick up. Check out the video below. It shows what happens after a car, (in this case a Ford Taurus) falls off a two post Car Lift. A two post lift is one type of lift that you must take extra care with. It is important to position the vehicle properly on the lift. Try to keep the center of gravity as close to the columns as possible. If you are going to remove a heavy component, such as a transmission, be careful to place tall jack stands under the vehicle. Any sudden shifts in weight could cause the vehicle to fall off the car lift, as it apparently did in this case. Also be careful to place the lift pads on the proper automobile jacking points, as designated by the manufacturer. Based on the text in the video, it appears that perhaps the cause in this case was a shift in the weight distribution of the car as parts were removed. There is always potential for a catastrophic disaster if proper safety procedures are not followed. You can view more about two post lift safety procedures on one of our previous posts. Customers love to send us their pictures of their auto shops and garages. They like showing off their Automotive Lifts in action and we love seeing them. The latest is from a customer in South Carolina who has a fabrication shop. They purchased our BendPak XPR-12FD Two Post Lift. And check out the truck they modified in the pictures! Very Cool. This is the kind of stuff we like. You are currently browsing the Car Lift Blog blog archives for December, 2010.